Stadler Joseph ein Schuhmacher sein Frau[en] ge- / tauftes Kind Christian, ist auf der / Windmüll beÿn Grün Thor an d.[er] / Frais b[e]sch[au]t word[en] nachmittag um / 4 uhr Gebohr[en] word[en] J:[ohann] C:[hristian] B:[aldamuß] (A-Wsa, Totenbeschauprotokoll 57, S, fol. 74v). This short-lived Christian Stadler was a younger brother of the legendary clarinet players Anton and Johann Nepomuk Stadler. The father of this child Christian was the legendary puppeteer and actor Johann Baptist Hilverding, the father of the dancer Franz Anton Hilverding. Francesco Alborea (b. 1691 in Naples, d. 20 July 1739 in Padua [not in Vienna]) was one of the most important cello virtuosi of the eighteenth century. He is frequently confused with his son Francesco, the cellist known as "Franciscello". This is one of six documents I published in 2009 that show Mozart as being addressed with the appropriate particle of nobility "von". 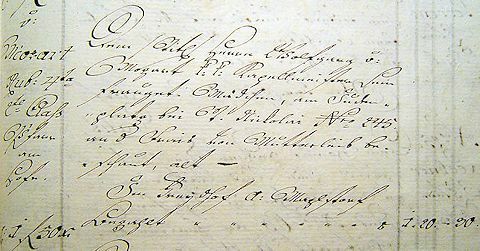 By now, the Bahrleiher already knew that the child was a girl, but the continuing uncertainty regarding the child's real name is reflected in the index of the particular volume of the payment records where the "fraugetauftes Mädchen" is given as "v:[on] Mozart Kristina". 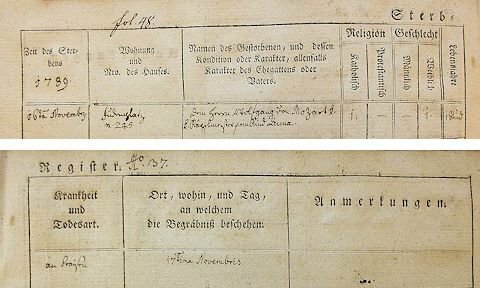 We would not know the first name of Mozart's second daughter, unless one of its parents had told Johann Herbst, the priest of the parish church Am Hof, that the child's name was Anna. 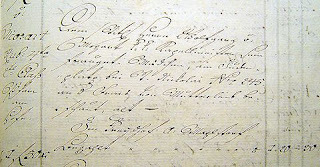 The entry concerning the obsequies of Mozart's daughter Anna at the parish church "Zu den Neun Chören der Engel" Am Hof on 17 November 1789: "Dem Herrn Wolfgang von[!] Mozart K. / K. Käpelmeister sein Kind Anna [Lebensjahre] 1 Stund" (A-Wstm, Am Hof, Tom. 1, fol. 48). 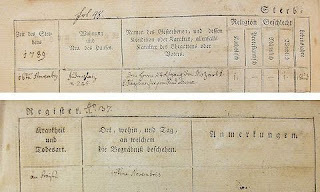 The picture shows the two halves of the entry whose original goes across two pages. Während das kirchliche Protokoll von einem Kinde weiblichen Geschlechtes spricht, verzeichnet das amtliche Beschauprotokoll der Stadt Wien unterm 16. November 1789 einen Knaben. Wer hat demnach recht? Es sei nur bemerkt, daß der Name Christian bei Katholiken zu den Seltenheiten gehört. 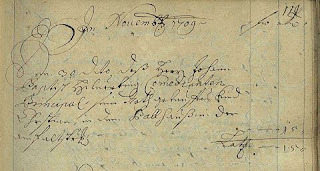 While the entry in the parish register speaks of a girl, the official register of deaths of the City of Vienna for 16 November 1789 lists a boy. Which, then, of the two entries is correct? It should be mentioned that the name "Christian" is rare among Catholics.